Take the pastry out of the cooler / freezer and let it warm up to room temperature so that it is possible to roll out. Peel the apples and cut them into wedges. Melt the sugar slowly. Be careful that it does not burn. Stir if it starts to smoke before it is all melted. Stir the butter into the sugar. Add the apples. Brown them until golden brown all over. The pieces should be whole, so they must not become too soft. When the apples are warmed up the juice is squezed out of them. This forms a thin syrup in the bottom of the pan along with the melted sugar. This should be cooked into a thick syrup. Otherwise the puff pastry base will quickly become soft and sticky when the cake is done. Roll out the puff pastry to a size that can just cover the pan. 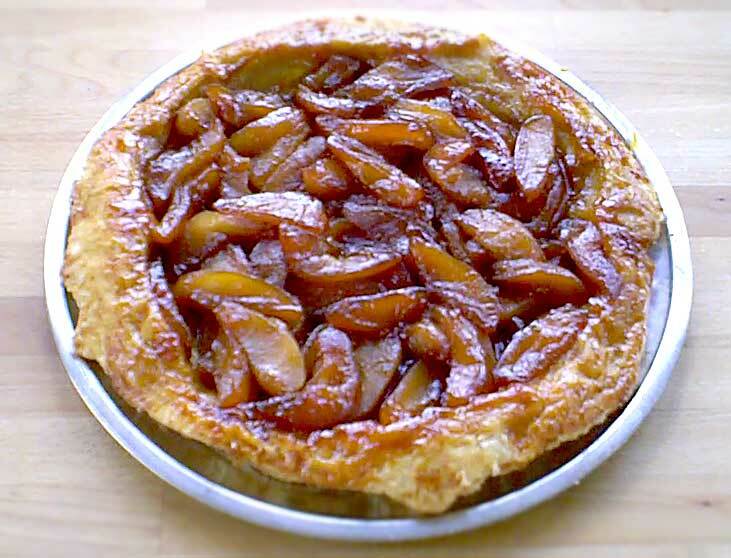 If you need more than one piece of pastry to cover the pan, glue the pieces together with a beaten egg. Cover the pan with the pastry and put in the oven. If your pan can't tolerate going into the oven, use a baking pan of the same size instead. Just pour the apples into it and cover it with puff pastry. Punch holes in the pastry to allow the steam from the apples to escape. Bake the cake in a preheated oven at 200°C (400°F ) for 20-25 minutes. Bake until the pastry is evenly browned. Invert the cake onto a serving plate so the pastry ends up at the bottom. Eat it a little warm, with sour cream or whipped cream. If you have some muffin tins that are not too high, like a low ramekin, you can make individual portions of this recipe. Just put the fried fruit at the bottom of the molds and then the puff pastry on top. In the same way as with the pan. Bake it in the same way as with the pan.